A composer and arranger with a degree in composition from the Berklee College of Music in Boston, Massachusetts, I have been writing Christian music ever since I made the decision to accept Jesus Christ as Lord and Savior. A native of Columbus, Ohio, I moved to Northfield, Ohio (A suburb of Cleveland) after 3rd grade, and then moved to New Jersey the summer after my freshman year in high school. With the exception of the 6 years that I lived in Boston I’ve lived in New Jersey ever since and I consider myself a Jersey Guy through and through. Both my dad and my uncle were trombone players so it seemed natural that I would become a trombone player as well. After a rather inauspicious start (See God Works in Mysterious Ways below) I became a fairly decent trombone player, making NJ All State Region II band and being the lead trombone player and a featured soloist with the NJ High School All State Region II jazz band in my senior year in high school. I attended The Berklee College of Music in Boston, Massachusetts with every intention of becoming a professional trombone player but became sidetracked first by an audio engineering class, then by a pop songwriting class. I changed my focus to songwriting and music production and graduated with a degree in composition. Shortly after college I sent demo tapes of my songs to a large number of record companies, producers, and A & R people. I had several positive responses and, after some research, selected the most influential of the respondents and met with him. I ended up signing a record deal with a major label. I went into the recording studio and recorded the first 3 songs of what was to become my album. The gentleman with whom I signed was working on a deal for me to go on the road, opening for one of the record company’s touring acts when he passed away unexpectedly. The whole deal fell through and, after waiting the requisite 18 months for the rights to my songs to revert back to me, went back to work to find another record deal. The gentleman who signed me had an extremely large wall covered floor to ceiling with gold records and he told me that he thought I was going to be a big star but I never got that close again. 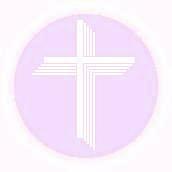 In my mid 20’s I accepted Jesus Christ as Lord and Savior and began writing Christian music. Though I’ve tried, I have never been able to get a publishing company interested in my music. Several years back I decided that having my music played and making no money was preferable to not having my music played and making no money so I self published my catalogue and registered with CCLI and OneLicense. Since then I have had thousands of churches all over the world playing my music. My Christmas Cantata, “The Holy Child” has been performed all over the world, has been translated into German, Russian, Ukrainian, French, Japanese, Korean and Polish (Not by me! ), and the Annunciation/The Magnificat from the cantata was recorded and released on CD by the Norwegian Choir, Sola Fide. 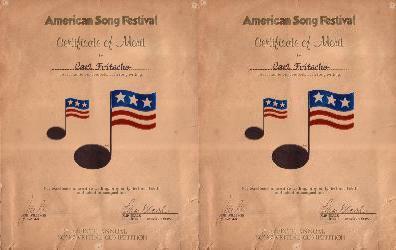 I have won multiple awards in international songwriting competitions including 5 honorable mentions in the American Song Festival and 2 excellences in songwriting awards in the Great American Song Contest. I am the Handbell choir director at Hope Presbyterian Church in Tinton Falls, New Jersey and am a member of the church praise band. 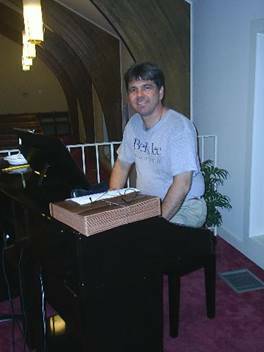 I play (As needed) drums, bass, piano, trombone, or trumpet with the praise band and I also sing with the vocal choir and the men’s quartet. My day job as a Bassett Furniture store manager pays the bills and I’m very blessed to have this job with an awesome company and a terrific staff. I have a modest collection of big band music published through Lush Life Music in the UK and distributed in the US by E-Jazz Lines. I love spending time with my family (ESPECIALLY my grandson and granddaughter J), making music, walking the beach in Ocean Grove, New Jersey, listening to, playing in, or arranging for big bands, Ryan’s Cinnamon Ice Cream, and rooting for the New York Mets. I must also confess to being a drum corps nut. I marched with the Eatontown, New Jersey Royales Jr. Drum and Bugle Corps from 1969 through 1972 and then served as Assistant Horn Instructor in 1979 and 1980. I remain a huge fan, enjoying both DCI and DCA contests when my work schedule allows. In Northfield I was blessed to have attended the Nordonia Hills Schools and Nordonia High School, a school district with a truly outstanding music program. I’d love to say I was their star trombone player but the truth is I wasn’t very good. I hated being in the band and I HATED practicing. Before I began 7th grade my mom, in a Spirit inspired stroke of genius, told me that I no longer had to practice, that I could be “As bad as I wanted to be”, and that I could quit band if I wanted, but only after I had finished my freshman year in high school. This was the perfect approach to take with me because I no longer felt the pressure to achieve and I was able to engage in music on my own terms. Now, whatever would possess a person who hated band to take on the additional responsibility of joining the school jazz band (The Spirit perhaps?) I did, and where I found band music to be mostly uninspiring, the playing of big band music lit a fire in me that has only grown with age and experience. I am indebted to my mom for knowing me well enough, and for having the wisdom to come up with a solution that allowed me to discover the joy of making music. I believe that it was God’s plan for me to be a musician and that; years before I knew Him, he was preparing me for a life of glorifying Him through music!